For whatever reason, Google decided that today would be a good day to add another one of its apps to the Play Store. In this case, we’re talking about Clock, in its most recent iteration that is. 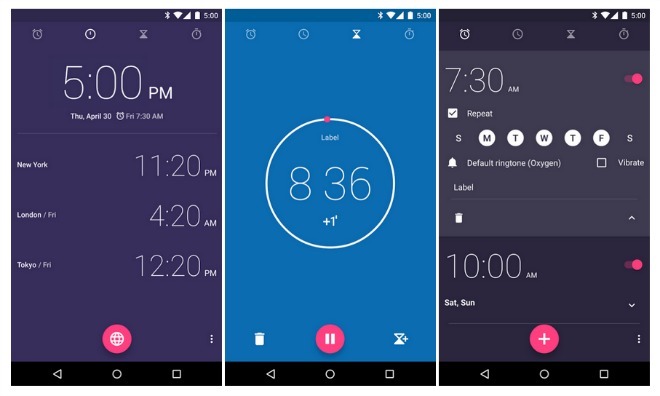 You can now install Google’s Clock if you so wish, and you’ll get an app that is heavily infused with the Material Design language that the search giant has been in love with since last year. So this might be a good option for you if your device’s manufacturer shipped an uglier Clock app. Or if you simply like to collect Google apps. The Google Clock has so far received updates only when new Android versions came out, but now that it’s in the Play Store it can be kept up to date by its maker in a much easier fashion. As you’d expect, this app lets you set alarms, add timers, and run a stopwatch. It also has a World Clock section where you can add your favorite cities to instantly see what time it is in each one of them. Last, but not least, you can connect to it to Android Wear to be able to snooze or dismiss alarms from your smartwatch.